Lock in a great price for Ciao Cacao – rated 9 by recent guests! Fun place with good community. The staff was very laid-back, friendly, helpful, and knowledgeable. They have done some great things to make the place inviting. The staff is incredibly nice and helpful. They answered all our questions (which were very specific) and beyond. The hostel is very nice and quiet, super-well located. 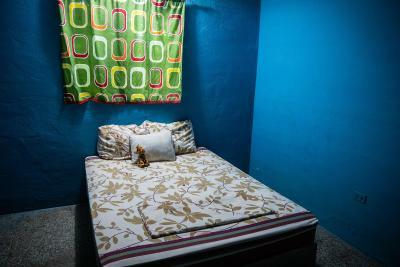 We had a private room which was very comfortable and liveable without AC (there is a fan). We're coming back next week! Staff was the friendliest and super accommodating, knowledgable & helpful! I would certainly stay here again! The Staff. The owner of the property is awesome. All tour and transportation tickets from him are of the best price in town. Cannot be beat. They were able to answer all my questions about El Mirador hike and it was a great surprise to see that they offered the tour at a way lower price than I had seen advertised online with other companies. I took the trip with them and had an awesome experience with a fun group and a guide and cook that were amazing!! 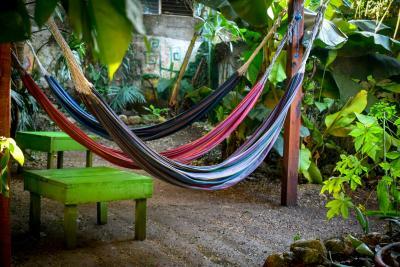 I really liked my time in the hostel as well, with the garden, having a puppy welcoming me at the check-in, tasty homemade ice cream after the 6 day hike, and the nice vibe around the place. I had an excellent stay at Ciao Cacao hostel. The owners are extremely friendly and informative, willing to help with anything you need. It is centrally located, everybody in the dorms has their own fan and power outlets, and the rest of the facilities are basic but all that you need. Wifi is good and they have an adorable puppy! They were very knowledgeable about the area and what to do, including some suggestions that were a bit off the beaten path. Fairly comfortable, good WiFi, good location, great value. They're fairly new, so still getting a few of the kinks worked out, but overall they're doing well and I really enjoyed the stay! Boasting a garden, Ciao Cacao is located in Flores. Guests can enjoy lake views. 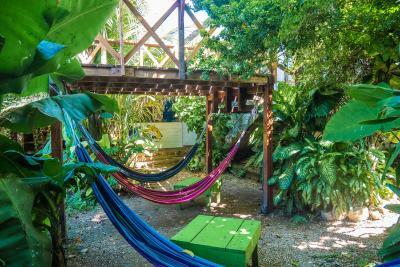 spacious tropical garden and affordable accommodations in a unique & eclectic location. Shared bathrooms with hot water shower, free wifi, free drinking water, indoor & outdoor common areas, tour & shuttle services at great prices and a mini tienda. When would you like to stay at Ciao Cacao? Our 9-bed mixed dorm is in the loft with wooden floor and offers personal fans, night tables with lockers, and electrical plugs for every guest. Private rooms include a queen bed, fan, large open closet, and window. House Rules Ciao Cacao takes special requests – add in the next step! Ciao Cacao accepts these cards and reserves the right to temporarily hold an amount prior to arrival. The sleeping area what very hot. The fans helped, but it was still hard to sleep. There was only one toilet and one shower, but I didn't find myself waiting very often. Great place in the middle of the city. Wouldnt say this is a social hostel but then again it may have just been the people whilst we were there. More of the hostel which has good standard offerings, very good location, and really good staff who are very helpful. You sleep in a room with no aircon and a lot of people, but that was alright for us. Philippa was súper súper nice, she arranged everything from the early Check-in, the tour and as well our shuttle to the next city with really fair prices! The selfmade ice-cream and the backjard with all the hammocks was amazing. Nothing. Great value for the price. 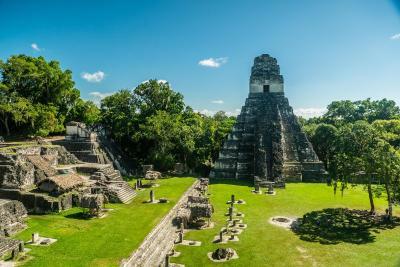 It was easy to communicate with the staff, they could help with reservations for the Tikal and shuttles. Really cool hostel. The staff is very kind and will help you with everything you need. Good price. Beds are a little uncomfortable (thin mattress on floor). But it was totally fine for a few nights. Incredibly sweet and helpful hosts! You’d love to stay with them. Great tour offerings, laundry service, little kitchen. Basically all you need! 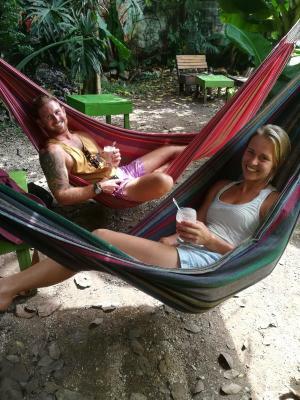 Chill vibe and easy to get in touch with other backpackers. There is a bathroom and a showeroom. Staffs were so kind and helpful. Fans are super loud, maybe another bathroom.